Triathlon is a changing sport. Over the past twenty years, there has been a tremendous amount of change to equipment, training methodology, and racing strategy. No detail is too small for those athletes whose main goal is to qualify to a world championship event. There is no bigger stage in triathlon than the Ironman World Championships in Kailua-Kona, Hawaii. What race should I enter in order to have the best chance to make it to the big dance in Kona? What times do I need in the swim, bike, and run portions to have a chance to qualify? I wanted to get some general demographic information to understand who enters these races. 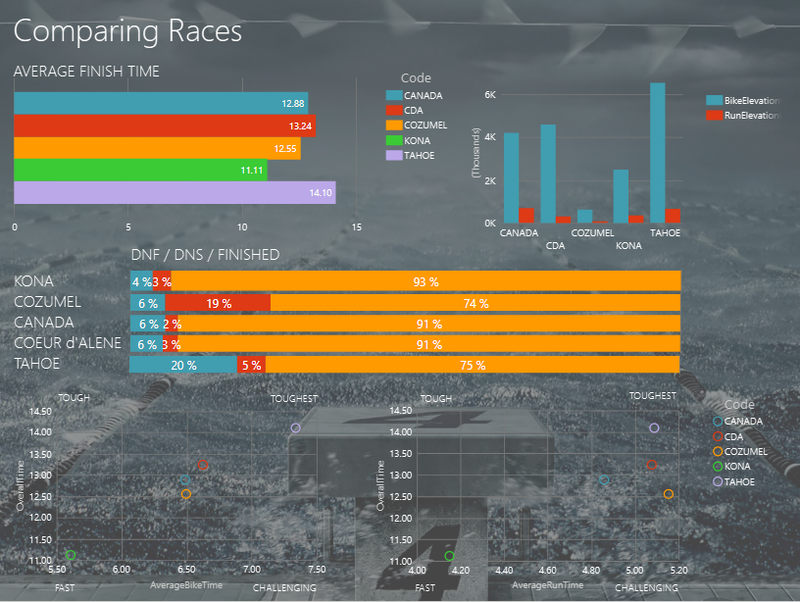 I also needed some recent race results to understand the characteristics of each race, and to get a better feel for the competition. 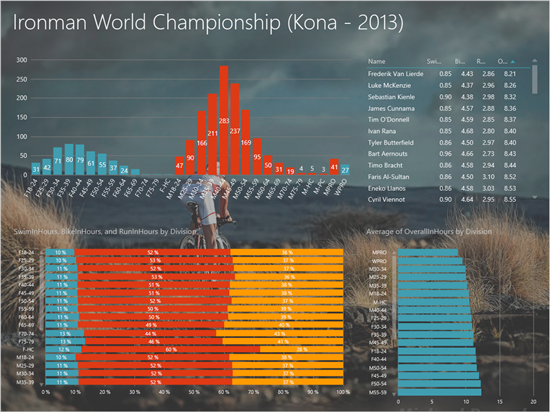 I gathered the demographics data from USA Triathlon followed by a few thousands of rows worth of results for different races from ironman.com, and this is a lot of data. 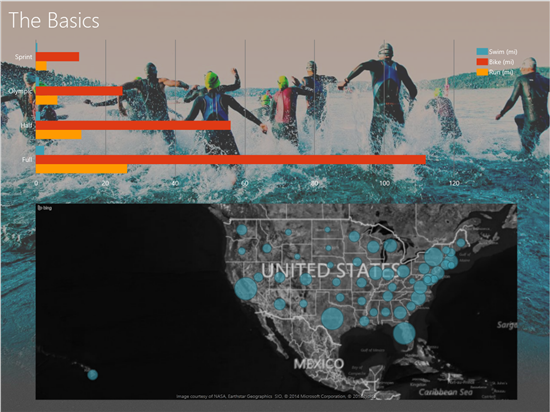 What made working with this data simple was using Excel and Power Query. Let’s focus on how I gathered results from the Ironman website. Ironman does a great job storing the results for all its races. However, the pagination system makes it hard to export results for further analysis. Here is where Power Query becomes essential. Without Power Query, I would have to manually copy each page to an Excel spreadsheet, which is extremely tedious and time consuming. I decided to write a couple of queries that would go through each page and collect all the results for a race. One great thing about the pattern above is that it can be used for any paginated table as long as the page number is passed through the URL. All of the transformations in the query (renaming columns, etc.) can be done through the Power Query UI, so the amount of code I ended up typing was minimal. Next step was to visualize the data. I used Power View to create a series of charts. By using these charts, I could begin to not only see the results, but also begin to gather insights. Here are some of the interesting things I found, as well as pictures for the different Power View report above. Here we can see the size of each age group participating, as well as the average completion time for each age group. To dig deeper into the data, I clicked on the ‘M30-34’ group in the horizontal “Average of OverallInHours by Division” chart, which cross-filters our data. This step shows us that the wining participant for the Age Group of males between age 30 and 34 finished in an astonishing time of 8.62 hours (or 8:37 minutes for those of us without a calculator). Now, let’s look at some of the races I am considering signing up for, and compare their 2013 results against one another. We will also include Kona for to get some perspective, even though it is a qualifying-only event. – Lots of people sign up but don’t start at Ironman Cozumel. My theory is that lots of people pull out of this race due to its proximity to Thanksgiving. 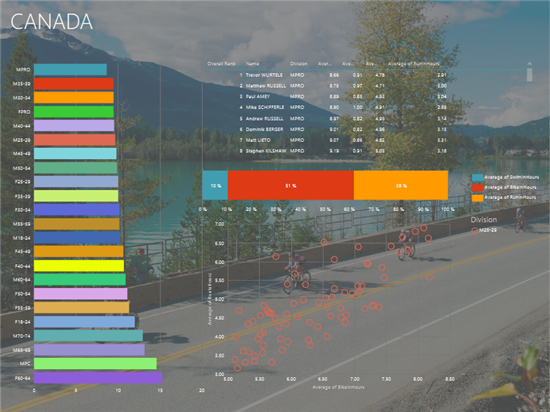 – The average finishing times for Ironman Canada and Ironman Cozumel are pretty close despite having very different elevation numbers. This doesn’t mean that elevation is not a factor. Instead, it tells us that there may be other challenges at Cozumel not accounted for in our data. In this case, those challenges are the added winds and humidity of Cozumel. – There is a huge gap between Kona and the other races as far average finish times goes. This is primarily due to the selective nature of a World Championship event. – Ironman Canada offers a balanced ride and a challenging run. This course seems to suit me, given that I am relatively light—meaning I don’t need to exert lots of effort while climbing on the bike—and I can run well in challenging courses. With this information at hand, we can now look at some specifics for Ironman Canada, such as the time breakdowns for swimming, biking, and running, and average finishing time for each age group. We will focus in on my Age group (25-29) and compare the average bike vs average run times using a scatter plot. – Age groups M35-39 and M30-34 were faster on average than the Female Pros. – The first four people finished in under 10 hours, and were all in the top 100 overall. This means that to have a reasonable chance to qualify, I would have to finish in about 9 hours and 45 minutes. This last insight is extremely important, and it will help me set up objective goals for my next training season. Actionable Insights: How Should I Move Forward with my Training? Using Power BI I was able to quickly gather use big data, and then slice it and dice it until I found the answer to my original question: What time do I need to qualify to Kona? The answer is 9:45 or better. Time to start training. Ready to uncover your own insights?